A small account also has a maximum 50,000 balance and 100,000 Rs credit limit. Also, you will not be able to withdraw more than 10,000 Rs per month from a small account. 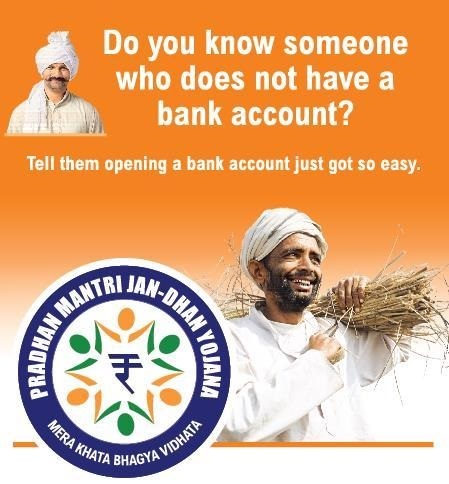 How to transfer old accounts under this Jan Dhan Yojana? The Prime Minister Office of India’s new initiative of Jan Dhan Yojana is appreciated for its approach to eradicate the economic discrimination prevailing in India by providing opportunity to every Indian to open a bank account with even a zero balance. This venture is the first step taken by the elected Prime Minister in India to bring equality in banking facility to every Indian. The banking system which was previously within reach of only the few Indians with a sustainable earning and who can successfully maintain the predetermined bank limit of their savings account; is now open to every individual Indian for its “zero balance” feature. Also to encourage every Indian to open an account, the lucrative features of this scheme include overdraft facilities of up to Rs. 5000 after successful operation of the account after six months from opening. Also the account holder gets a personal accident insurance cover of Rs.1 lac and Rs. 30000 for life insurance coverage. These features indeed can inspire most account holders to learn how to transfer their old accounts under this Jan Dhan Yojana. However to avoid complexity and account mismanagement, an account holder does not have to re-open a different account under this scheme. In order to learn how to transfer their old accounts under this Jan Dhan Yojna, the account holder of any bank just needs to issue a RuPay Card to avail the insurance facilities offered under PMJDY scheme. Therefore an already existing account holder does not need to open a separate Jan Dhan Yojna account to avail the insurance benefits.